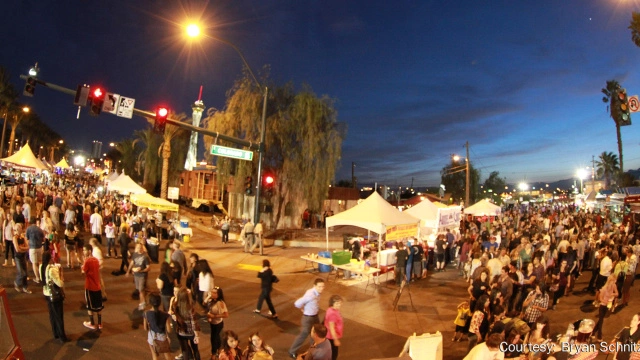 WHY ARE LOCALS FLOCKING TO 18B LAS VEGAS ARTS DISTRICT? What you need to know about the Arts District (18b), the epicenter of incredible cultural activities and events in Las Vegas. That ancient smoky image of Las Vegas that still comes to mind for many potential visitors is as much a relic of the past as The Dunes Hotel or The Landmark (both Vegas hotels, both intentionally imploded in the mid-90’s). Vegas has enjoyed somewhat of a renaissance over the past several years, and the area that has seen the greatest level of “rebirth” is downtown Las Vegas. It is here that you can enjoy world-class gaming, luxurious hotels, and fine dining opportunities (all hallmarks of the Vegas experience), while sitting just blocks away from eclectic art galleries, outdoor music performances, and other cultural experiences. Let’s take a look at some of the hot spots in the Arts District today. A glimpse into a different side of this iconic area will allow you to see Las Vegas in a completely new way. 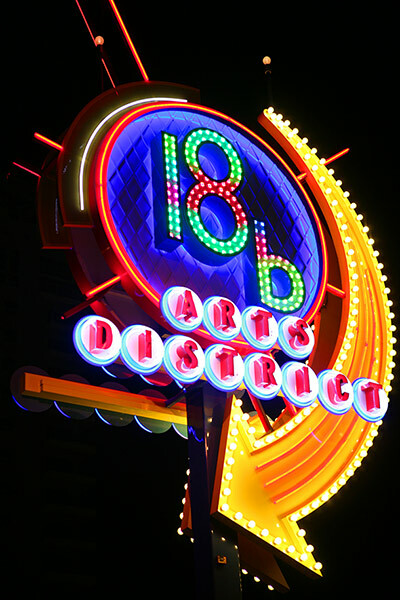 The Arts District, known as “18b,” refers to the expansion of the area across 18 blocks in downtown Las Vegas. It is easily accessible if you have a car, and parking is conveniently located right in the neighborhoods that are adjacent to the area. If you don’t have a car, consider taking the SDX or Deuce bus from Fremont Street. Then, exit at the 18b Arts District stop while on Casino Center Drive. If you’re a local, well, it’s easy enough to walk to this exciting destination. The Arts District is obviously well-known for its artists and galleries. This area offers unlimited opportunities to mingle with local artists and view completed works that range from eclectic to modern, classic to avant garde. And the steady stream of visiting artists keeps things fresh and exciting for locals and visitors, alike. The Arts Factory is a great first stop, as the building boasts nearly two dozen art-focused tenants that rent space. Room for poetry readings and musical performances abound in The Arts Factory. Or, check out Art Square. This location is smack dab in the middle of the 18b Arts District and features 16 unique retail, creative, and professional spaces that showcase an array of artistic endeavors. Check their calendar for specific events that may appeal to your sense of artistry. Additionally, First Friday is a frequent stop for locals when it occurs once-monthly. As the name implies, First Friday happens on the first Friday of each month and drives a massive influx of more than 20,000 people to the neighborhood – starting around 6pm and culminating around midnight. Expect to find a friendly, inviting, and eclectic group of artists, performers, retailers, and spectators. Food trucks generally provide the easiest access to snacks and drinks – and some of the offerings border on exquisitely inventive. There is never a shortage of things to do in this artistic hub known as 18b Las Vegas. From First Friday to Preview Thursday, live music to permanent art exhibitions, workshops, theatre, and even health and wellness expos, there is something for everyone. Follow the Arts District on Twitter at @ArtsDistrictLV to keep up-to-date on the latest artistic opportunities in the area. A monthly arts district board meeting is also held on every third Tuesday, which provides an insider’s look at all the happenings in the neighborhood. These meetings are open to the general public and are generally focused on ways to improve the Arts District experience and support the mission and vision of local and visiting artists and Las Vegas culture. Locals tend to know the hot spots and exciting venues in Vegas, and the 18b Arts District is certainly one of them. If you’re considering a relocation to downtown Las Vegas, know you’ll have access to arts and culture just blocks from your front door.